Dahi (yogurts), raita, lassi, curds, butter and ghee -- all made from milk -- have always been commonly enjoyed in India. This is why Hindus hold cows in high-esteem, having relied on them for basic sustenance since ancient times. Foods made from fermented milk keep the digestive tract healthy, especially the colon thanks to good bacteria from the Lactobacillus family. 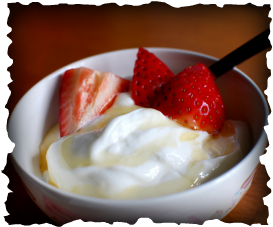 Furthermore, yogurts and dahi limited the development of cancerous cells in the colon (Wollowski 2001 American Journal of Clinical Nutrition). And because dahi and other fermented dairies are packed with calcium, eating them regularly can help you keep from gaining excess body fat. Doing this even helps people trying to lose weight shed even more pounds off (Zemel 2005 International Journal of Obesity). Finally, eating calcium-rich fermented dairies daily helps at-risk people prevent developing insulin resistance, which is often a precursor to both diabetes and coronary heart disease (Pereira 2002 Journal of the American Medical Association).